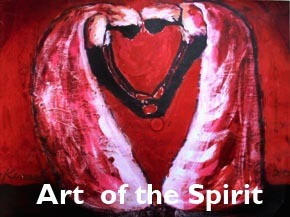 When I entered St. Mary’s shelter, I had nothing but the clothes on my back and the desire to change. I no longer wanted that homeless lifestyle, and buggy-pushing. I had to take the time to be reborn from within. I want to show people they have a choice. When I was living on the streets, I was running from life. I had no responsibility. It was just to get away from reality. This is what I chose to do. I was born and raised in Oakland. In the late ‘80s and early ‘90s, I owed someone money I couldn’t pay and was forced to leave my surroundings. I ended up with the homeless, hiding out. I adopted their way of life. I got comfortable. I began recycling. I was a regular out there. 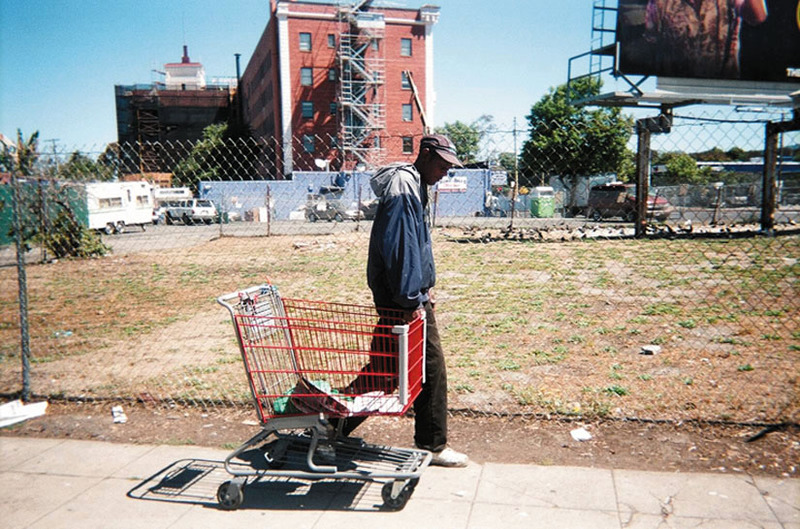 I got my buggy, or shopping cart, and began the habit of looking for things people threw out. I would sometimes take my recycling to Alliance Metals. I didn’t like digging through the trash, so I mostly found items left on sidewalks and resold them. Either way, it was a journey. Recycling was a job. I would get up early to find things and get to the recycling center before it closed at 4 p.m. After a drop-off, I might go on another run just to get a little extra money. Employees from recycling centers will come home from work and buy recycling from 7 p.m. to 12 a.m. at their homes for half the price — catering to people who just need a few dollars. Other folks run other recycling operations all night — some out of their trucks — but they pay even cheaper. At the end of it, you may get a few hours of sleep. You burn out. People also have their recycling neighborhoods — areas where they’ve been recycling for years. If you come into their territory, you’re gonna have a problem. This could happen here in West Oakland or up north in Berkeley. If you’re not a real tough person, you worry about something being done to you and doing something to somebody. It’s a whole other world. I would often tell myself, at the end of a long day of recycling, wouldn’t it be nice if I just had a regular eight-hour job? A 9-to-5 job, where I could actually sleep and rest and be myself? But this is how we survive. The closing of Alliance Metals is like closing a factory, like Del Monte in Emeryville, where hundreds of people lost their jobs. All recyclers are entrepreneurs. Every day they hustle to bring cans and bottles to the center. But they won’t get unemployment; everybody’s stuck. When Alliance Metals closes, the recyclers will likely start stealing and doing whatever they have to do to survive. I’m not saying it’s right, but what else are they going to do? While you do have some bad seeds, you have a lot of people who do this to live — for positive things. They’re part of the neighborhood too. After living as a recycler for so long, I didn’t think there was another way. From 1993 through 2012, I was in and out of the penitentiary and in and out of this lifestyle. I became a squatter. I would find an abandoned house and sell drugs. I was stealing and selling drugs, and not using them; but I was no better than anyone else. It’s really sad when you say you’re all right with it. It’s a really dark place. My family would come looking for me, and I would say to them, “I’m fine.” I was not ready to do something different. My son, my family, my mother — nobody could force this on me. Because I had to retrain myself from within. In 2012, I was arrested for possession of stolen property. It was the best thing that could have happened to me. This time felt different. I knew I was touched by the grace of God. While I was in jail, I met a man who told me really good things about St. Mary’s Center in Oakland. When I got out, I went straight to St. Mary’s and entered the Winter Shelter. I had nothing but the clothes on my back and the desire to change. “A Way to Survive.” Arivnwine took this photo as part of “On Our Way Home,” a photography exhibit created by St. Mary’s Center. “When I was homeless, I used a shopping cart to carry my belongings and to recycle,” said Arivnwine. St. Mary’s is down the street from the lifestyle I knew, so at first I didn’t want to be there. But something pushed me forward. I lived at the Winter Shelter for four months. At the shelter, I was introduced to all kinds of programs. I went to classes every day that covered things like money management, changing your emotions, even art. That’s when I drew a new picture of “my apartment,” before I got it. I no longer wanted that homeless lifestyle, and buggy-pushing. I had to take the time to be reborn from within. Everything starts from within. Then, I made a plan. Once you make a decision to do something different in life, you have to have a plan. With a stable place to stay, I applied for General Assistance and was able to get a bus pass, a BART pass, and eventually a cell phone. With just a little money to build with, everything started. Now, at 60 years old, I have been living in my own apartment for three years. I come to St. Mary’s Center to talk with others. I encourage them, and give them something positive to see. I have seen a lot of people make transformations similar to mine. When I was living on the streets, some people gave me a few dollars here and there, but never once would they try to make me feel like I was a bad person. That’s why I never say anything negative. I always try to be positive and encouraging. When I see the folks I used to live around, they say, “You was right there with us. Whatever you have to say, I’ll listen because you understand what we are going through.” I have to be strong enough to be around these people so I can offer that encouragement. God gave everybody free will. You’d be surprised: you do have a choice. Three years later, I’m still learning new things. I want to be here to show people they have a choice, just like somebody did for me. Editor’s note: Keith Arivnwine first learned about St. Mary’s from a prisoner in jail. 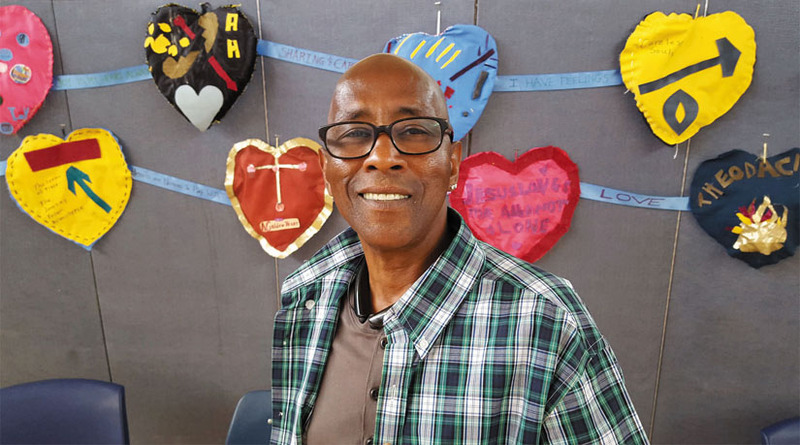 That man was Cornelius Saulsberry, a well-loved member of the community who helped many people in his Oakland neighborhood, helped women feel safe in bad areas, and referred many people to homeless programs. Everyone loved his great sense of humor. 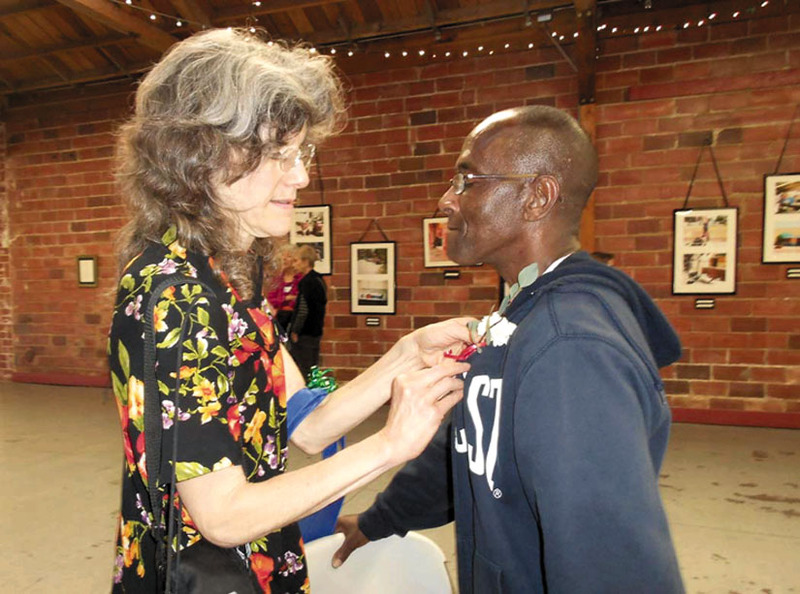 Sadly, Saulsberry died suddenly last month, and Arivinwine gave a very moving tribute to his friend at a recent memorial at St. Mary’s for members of the community who died. Cornelius will be greatly missed.